S&P Global Ratings analysts Terry Chan and Chris Lee address some of the most urgent questions investors have about China's growing debt problem. Is the current growth rate of China's debt sustainable? Yes for the near term; no for the medium term. The ever-increasing level of China’s corporate debt is intensifying risks because of weakening borrower credit quality. If the current growth rate continues unabated over the next five years, the likely rise in nonperforming debt could place greater strain on the financial sector and lead to a higher level of problem loans, possibly leading to some bank recapitalisation. However, this is not our base-case scenario. Our base-case expectation is that the momentum of corporate debt growth, in particular, will persist for another two years. It should then ease as the Chinese economy further rebalances from being investment- and heavy industry-led toward one more reliant on consumption and services. Also, implementation of reforms to control leverage will likely have more meaningful progress in two years. Restructuring of highly indebted corporates has begun in earnest under the supply-side reform policy. The slow start since early this year belies the gradual centralisation of authority. Will risks in China’s corporate sector abate anytime soon? No, we think that troubles for China's corporates are far from over. 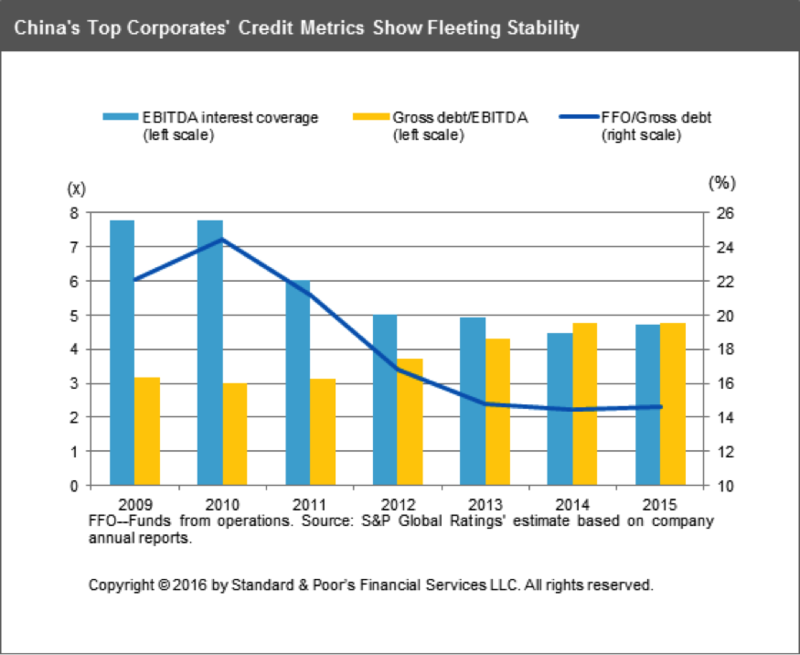 We expect the credit profiles of the top companies in the country to continue to deteriorate in 2016. What’s more, we expect leverage to increase further in 2017. Our just-completed 2016 study of the top 200 companies in China estimates that the median debt-to-EBITDA ratio is likely to increase to 5.0x-5.5x in 2016, from about 4.8x at the end of 2015. Leverage of state-owned enterprises (SOEs) has continued to increase. Sluggish demand and weak pricing has more than offset a reduction in costs and capital expenditure. SOEs comprise about 70% of the top 200 companies we sampled and 90% of their total debt. At the end of 2015, leverage had deteriorated sharply in some sectors, particularly metals, oil and gas, mining, and real estate. Leverage, as measured by the ratio of debt to EBITDA, increased by more than 30% for these sectors, compared with 2014. Except real estate, these sectors have large state ownership. With the exception of oil and gas, they also have large excess capacity. Are China’s SOEs better placed than private enterprises? No. The divergence between the credit metrics of SOEs and private sector enterprises continued to widen in 2015, and we expect further deterioration in the credit strength of SOEs as they continue with their debt-funded expansion. In the first eight months of 2016, the Ministry of Finance reported that SOEs increased their total assets by 15%, even as their profits declined by 6.5%. These companies' total debt has increased by about 18% over the same period. On the other hand, we have seen signs of a turnaround among privately-owned companies. Cost control and capex reduction have eased the pressure on cash flows. Free cash flows are turning positive for some of the troubled sectors. Cash flows should continue to improve as companies step up discipline in investments. 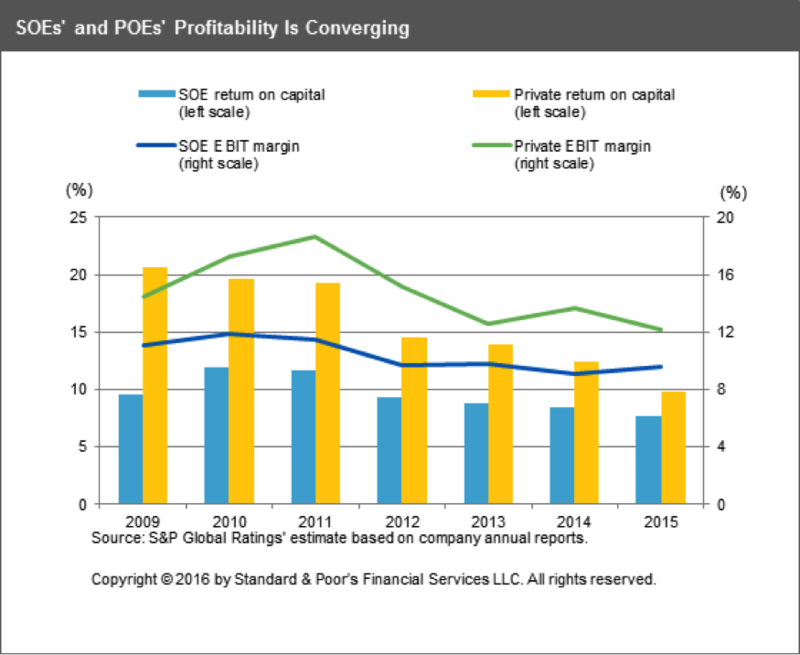 The divergence in credit risks between SOEs and private sector companies will therefore continue to increase. The downside risk to the credit metrics of China's top companies is the continued sluggishness in demand and pricing. High leverage in corporates will likely constrain investments and aggregate demand. The cooling of the property market will also put a dampener to construction activity and investment demand for property-related sectors. Property investment has rebounded somewhat in the first eight months of 2016, but the recovery is tepid and may be derailed by tightening of mortgage loans and administrative measures to deflate prices. By October 1, more than 15 large cities had announced measures to restrict housing purchases and increase down-payments for mortgages. Can China’s banks withstand the growing risks? Over the next year or two, we believe China's banks have sufficient financial strength to absorb potential losses that may arise from the still-high growth rate of debt. Under our base case, credit growth would moderate by a third less by the year 2020. Even so, problem credit-to-total credit could double to 10% from our 2015 estimate of 5.6%. Problem credit here is defined as nonperforming credit plus special mention loans. In our base case, deposit-taking institutions may choose to top up equity by Rmb3.6 trillion ($500 billion) to maintain capital ratios at current levels. With banks generating a 10% return on equity, such capital replenishment, made over several years, should be feasible. But in a downside scenario -- where we project the corporate credit growth rate to continue unabated -- problem credit could triple to 17%. This may necessitate banks to raise capital of up to $1.7 trillion, or 16% of 2015 nominal GDP. Will China allow debt to rise unabated? The potential for policy missteps by Chinese authorities in managing their massive corporate debt is one of the top global risks facing credit markets. We expect the authorities to continue allowing fast credit growth over the next 12-to-18 months to support economic growth targets at 6.5% but not the following two-to-three years. In our base case, we expect China’s overall credit growth to moderate by a third less by the year 2020. Whatever transpires, we expect more action from the Chinese authorities to rein in the less-productive credit growth in the coming years. This action should come on top of the recent local government debt-for-bond swap program, regulatory action on banks' off-balance-sheet activity (such as wealth management platforms) and — albeit very slowly — reform of SOEs, particularly in the heavy industries. If such actions are not forthcoming, a possible rise in problem credit might necessitate some recapitalisation of the banking sector. The article was written by Terry Chan, managing director, and Chris Lee, managing director, at S&P Global Ratings.